Take a moment now to stop and breathe. Are you looking for more grounding or mindfulness in your life, but not sure how to make it easier to do it? I’ve collected a few reliable and simple resources for you. If you want to meditate, I encourage you to get at least some basic instructions. It’s too easy to have it be unproductive or frustrating — while it can be so simple and rewarding with a little instruction. They’ve got some short basic beginner-level meditations. Great starting place. Download this free app and you’ll get access to a huge selection of guided meditations, silent meditation options with various chime timers, and a community of meditators worldwide so you can see how many others are meditating at the same time to add to your inspiration. You can search the guided meditations by length or topic. 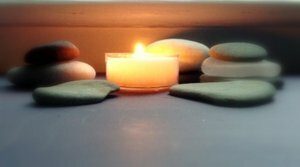 I highly recommend finding a local Insight Meditation class for beginners. There’s no dogma or rules, but they bring some wisdom from the Buddhist tradition that I have found quite useful. (Use this link to search Google for Insight Meditation class near you.) This has made a big difference for me. Want a little extra reading on meditation and mindfulness?